KEF E305 surround speaker system due in shops in April | What Hi-Fi? On the way in April is the new KEF E305 surround-sound speaker system, the latest version of the company's famous 'egg' sub/sat design, which will sell for £900. Like previous systems dating back to the original KHT2005, launched in 2000, it uses a set of satellite speakers in their distinctive ovoid housings together with an active subwoofer, and can be expanded from a 5.1-channel set-up with the addition of extra E301 speakers. The 11.5cm midrange cone is made from aluminium, and designed to operate rigidly across the entire vocal range for accurate reproduction of dialogue. It's mounted with KEF's Z-flex surround to allow full excursion without edges likely to affect the tweeter's output, and has an undercut magnet motor to create a symmetrical magnetic field for better transparency and less midrange distortion. Reinforced with internal ribbing, the cabinets are damped using technology derived from the KEF LS-50, are designed to minimise scattering of the driver output by the front baffle, and have an integral stand/wall-bracket. The satellites are designed for smooth integration with the KEF E-2 active subwoofer, creating the impression of full-range speakers according to KEF, and uses a long-throw 20cm bass unit driven by a 250W Class-D amplifier, in a sealed box for fast, punchy bass down to a claimed 33Hz. The E-2 enclosure also borrows from the design of the Award-winning LS-50 speakers. 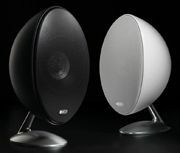 Available in black or white, the KEF E-305 system will be in the shops at the end of April.